Every Hurricane Season, Florida Residents brace themselves for potential damage to their homes. If you live in Florida or any other region of the southeastern U.S., you’ve likely experienced the power and destructiveness of hurricanes firsthand. High speed winds and flying debris can cause massive damage to the exterior and interior of your home or business. To keep those on your property safe, and to guard against expensive damages, it’s important to protect your property during the hurricane season. Here at Sun Barrier Products, we’ve developed a full line of hurricane shutters designed to protect residential and commercial properties from hurricane damage. With almost 30 years in business and thousands of properties served, we are the right choice for all of your hurricane protection needs. Learn more about our hurricane shutters below, and contact our team (407) 830-6556 today! Here at Sun Barrier Products, we stand by the quality of our hurricane shutters. That’s because we’re involved in every step of their creation — from design to manufacturing to installation. We’ve been developing and installing hurricane shutters for homes and businesses across Florida since 1988, and pride ourselves on our industry-leading quality products and professional installation. We strive to stay up-to-date on the latest building codes, offering our clients a wide range of hurricane shutters that are not only safe and secure, but stylish and in a price range to fit every budget. Read on for a full list of our available hurricane shutters. No matter what type of hurricane shutters you are looking for, we have the products for you. We proudly design and manufacture several types of Hurricane Shutters to protect your home or business. 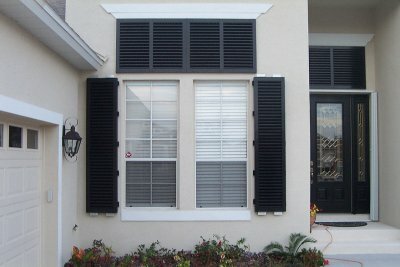 Roll-Down Shutters: These hurricane shutters can be rolled up and rolled down depending on when they are needed. Custom engineered from industrial-grade aluminum, our roll-down shutters are available in white, ivory, beige, and bronze colors. We have both motorized and manually-operated shutters available. Accordion Shutters: Manufactured from extruded aluminum with an electrostatic-ally applied baked-on finish, our accordion shutters are excellent for hurricane protection and security. Bahama Shutters: Bahama shutters can be easily added to your windows to keep heat and sunlight off your home or business, as well as keep wind and flying debris out during a hurricane. Both their frame and blades can be adjusted for custom climate protection and privacy at any time. Colonial Shutters: Our colonial shutters are great for those looking for a custom-made, traditional hurricane protection solution. With the obvious advantage of being able to be opened and closed and any point, our colonial shutters are also incredibly durable and available in a wide range of colors and styles to fit any building. Storm Panels: Removable and highly-affordable, storm panels are the most economic hurricane protection product available today. Our storm panels are made from corrugated aluminum for lightweight protection that is still quite durable. They can be mounted directly or mounted using the Snap Track system. If you are interested in learning more about our hurricane shutters, or would like to inquire about the possibility of having shutters custom-designed and installed on your home or business, don’t hesitate to contact our team here at Sun Barrier Products. We proudly offer free estimates on all of our work. Call our Orlando, FL professionals at (407) 830-6556 for a free estimate today!